Rex W. Tillerson, chairman and CEO of ExxonMobil, and his wife, Renda, have made a personal pledge of $5 million to support the Engineering Education and Research Center (EERC), a 430,000-square-foot facility. Rex W. Tillerson, chairman and CEO of ExxonMobil, and his wife, Renda, have made a personal pledge of $5 million to support the Engineering Education and Research Center (EERC), a 430,000-square-foot facility that will transform the Cockrell School of Engineering at The University of Texas at Austin. The Engineering Education and Research Center (EERC) will transform the Cockrell School of Engineering at UT Austin. 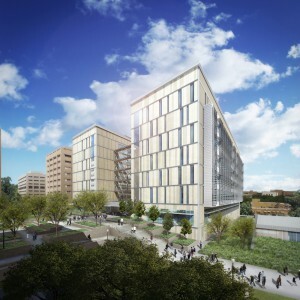 When completed in 2017, the EERC will house advanced teaching, research and student project spaces that will foster multidisciplinary collaboration among students and researchers in the Cockrell School’s seven departments and among thought leaders across the UT Austin campus. “Renda and I could not be more excited about what is happening at the Cockrell School, and we are delighted to support the Engineering Education and Research Center, which, when completed, will be one of the great engineering education facilities in the country,” Tillerson said. Tillerson received his bachelor’s degree in civil engineering from UT Austin in 1975, and his sons, Robert and Michael, are graduates of the Cockrell School. He is a member of the school’s Engineering Advisory Board and of the UT Development Board, and he is a life member of Texas Exes and the Cockrell School’s Friends of Alec program, which raises annual fund donations. Beginning with his first gift in 1978, Tillerson has been a devoted supporter of many UT Austin departments, programs and services for students. As an alumnus, Rex Tillerson knows the Cockrell School well. He recalled the time he spent studying in the university’s current engineering buildings and expressed the importance of new facilities for current and future students. The Tillersons’ gift comes at a significant time for the Cockrell School. Last month, the school announced a rise to the top 10 in U.S. News and World Report’s 2015 graduate program rankings, and in January, the school announced a $20 million gift from the Mulva Family Foundation for the EERC. Tillerson began his career at Exxon Company in 1975 as a production engineer. He became chairman and CEO of ExxonMobil in 2006. In 2013, Tillerson was elected to the National Academy of Engineering. The Tillersons’ gift comes as the university nears completion of the Campaign for Texas later this year. So far, UT Austin has raised more than $2.82 billion toward its $3 billion campaign goal. Both Tillerson and ExxonMobil have shown an ongoing commitment to the success of the Cockrell School of Engineering and have an extensive history of supporting academic programs and functions across The University of Texas at Austin. ExxonMobil has contributed more than $55 million to the university since 1975. Of that total, nearly $17 million has gone to engineering programs.